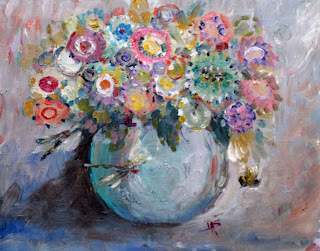 Flowers in the Spring a floral painting that is expressionistic. This painting was not a daily painting but took several weeks to complete. It is a very large oil painting that is for sale. When objects in art just touch it is called a kiss. These cone flowers just kiss on the cheek in passing. Butterfly, one of my favorites. Cheek kisses, like your auntie used to give you. Earlobe ones, those I hate. Eye kisses, what ever. Finger kisses,oh so romantic. Foot kisses, now that is a whole different subject. Forehead kiss, like the kind an old lover gives on his way out. French kisses, now your 16 and really know your way around kissing. Fruity kisses, those I learn to give when I was in Montana. It was along time ago but I still remeber those sweet little kisses. Hand Kisses, oh so European. Hickey kisses, haven't seen that mush passion in years. Mistletoe Kiss, oh yes I long for Christmas when lissing anyone is allowed if you have a little mistletoe.Note to self buy Mistletoe. Letter kisses, only when you are 12 going on 13. I had a dream a few nights ago about a painting I had done. 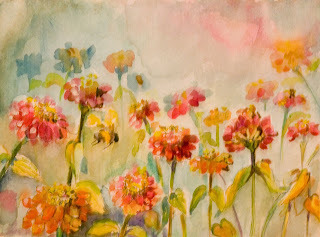 It was a floral painting with bees and dragonflies. I tried to paint it last night but I think I missed a few things I now remember in the dream. 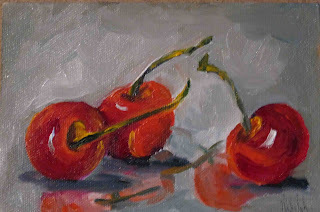 I will try to work it out in water color then if I think I have the concept I will try it in oils. Today I am planting my garlic. It will be ready next August. 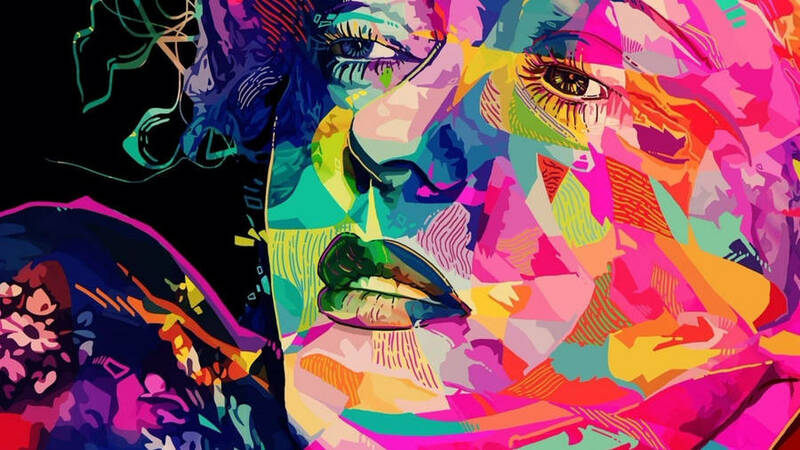 Iris: Associated with death as Iris was a Greek goddess of the rainbow, which she used to travel down to earth with messages from the gods and to transport women's souls to the underworld. The three upright petals and three drooping sepals are symbols for faith, valor, and wisdom. 1. Prepare the batter first. Sift together dry ingredients, then whisk in milk, beer or cold water until smooth. Cover and set in the refrigerator for 30 minutes. Leftover batter can be stored for up to two days. If it is too thick after refrigeration, add a few drops of water to return to original consistency. 2. Meanwhile, prepare the stuffing. In a bowl combine the ricotta cheese, garlic, salt, pepper, mushrooms and basil. Open the blossoms and spoon about one 1/2 teaspoon of the mixture into the center of each. Avoid overfilling the blossoms. Twist the top of each blossom together to close. Place on a baking sheet and refrigerate for 15 minutes. 3. Pour the oil into a skillet to a depth of 1/2 inch. Heat over high heat until a small cube of bread dropped into the oil turns golden brown within seconds. 4. Briefly dip each stuffed blossom into the batter, then carefully slip into the hot oil. Cook until golden on all sides, about three minutes total cooking time. Add only as many blossoms at a time as will fit comfortably in the skillet. Transfer with a slotted utensil to paper towels to drain briefly. 5. Sprinkle with salt, if desired and serve immediately. This painting was done "en plien air"
Still life vegetable painting of onions and gallic. A childhood treat - with a kick! Use a scoop of vanilla ice cream instead of cream & ice, and you've got a Dreamsicle. Serve in a large stem or hurricane glass. YUM! The back is wired and sides are painted. About This Painting:This daily painting is an oil painting of five cupcakes with party favors. All kinds of cupcakes here, all are ready to party. 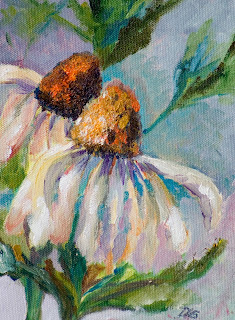 6x12 oil on gallery wrapped stretched canvas. The sides are painted and the back is wired the painting can be hung as is or framed. Need a special gift for a friend I'd email me. 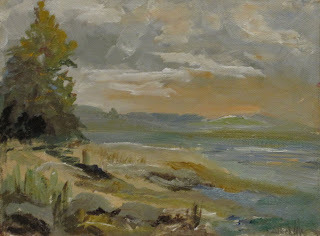 State of relaxation was the title I gave to this painting while plien air painting on Little Travers Bay in Michigan. 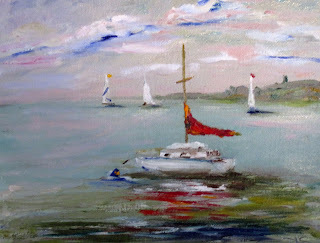 This sail boat was painted in plien air on a day that the rain was off and on all day long. Me at my box or plien air easel. Artists have long painted outdoors, but in the mid-19th century working in natural light became particularly important to the Impressionism. 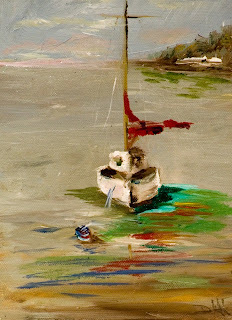 The popularity of painting en plein air increased in the 1870s with the introduction of paints in tubes (resembling modern toothpaste tubes). Previously, each painter made their own paints by grinding and mixing dry pigment powders with linseed oil. It time to celebrate every one's birthday for the month of September. Blow out the candle and have fun. A happy birthday for everyone having a birthday this month. I am still hard at work canning tomato's. I would much rather paint them. Oh well, be prepared for paintings of big plates of spaghetti this winter. I only use the finest quality paints and paper in my work. It's the weekend I have been working in my garden all day. 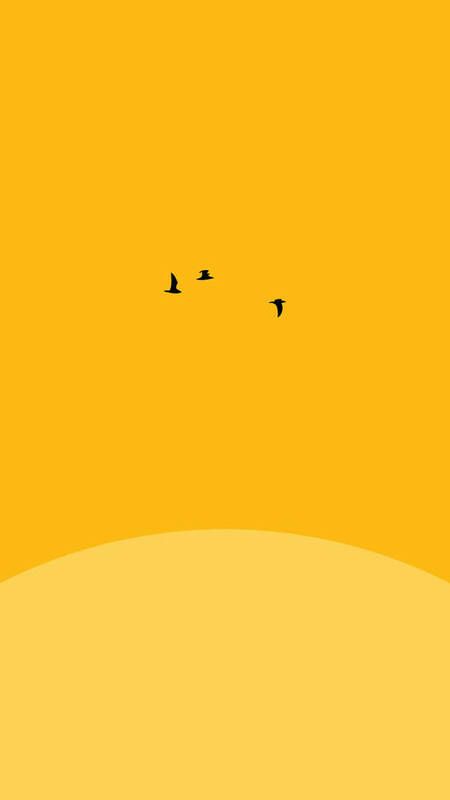 I have put up 2 new bird feeders but have yet to get any birds eating there. I have a have a heart trap out by my tomato's because some little animal finds them as delicious as I do and I don't like to share. I caught the neighbors cat in it last night. White kitty was not happy when I let him out this morning. 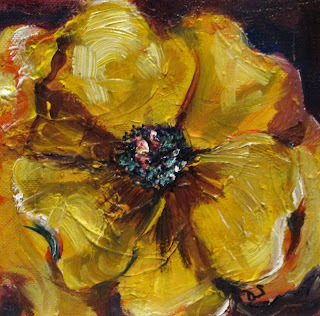 About This Painting: This is a small abstract painting in my Emotions of Color Series. oil on gallery wrapped stretched canvas with painted sides. The back is wired and the painting can be hung as is or framed. 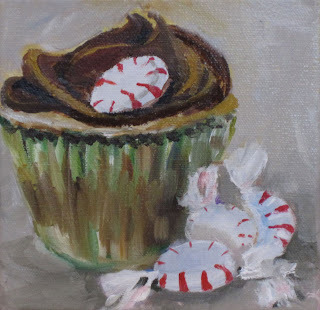 About This Painting: This little daily painting of cupcakes is so yummy you will almost want to eat it. Gallery wrapped stretched canvas with painted sides and wired back. 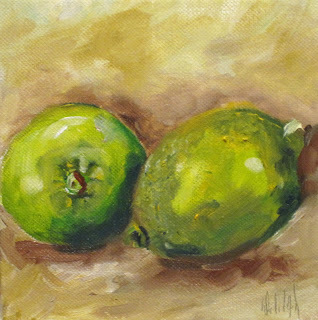 Small paintings make a wondeful gift or collect several for a wall grouping. 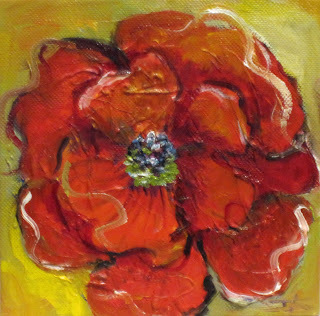 I have been working on a series of small abstract poppies.These are fun little paintings that work well when hung as a grouping. This is a plien air paintings done in Michigan. I hope everyone is having a wonderful holiday weekend. This was painted on Little Travers Bay at Bay Harbor Michigan en plien air. 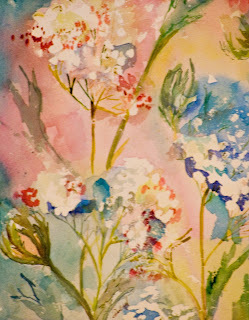 This daily floral painting is done in watercolor and is for sale. 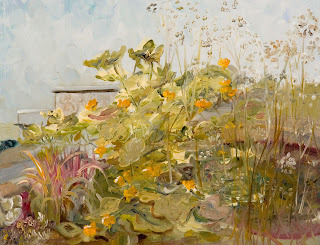 Queen Anns Lace watercolor on 140 lb coldpressed watercolor paper.